A government audit report released to members of Burma's Lower House of Parliament last week provides evidence of rampant corruption in six key ministries under the former junta, all of which were led by prominent members of the current administration. According to the findings of an investigation carried out by the office of the auditor general, the six ministries were accused of misusing billions of kyat in government funds and engaging in a variety of illegal transactions. The ministries singled out by the report were the Ministry of Information, the Ministry of Co-operatives, the Ministry of Agriculture and Irrigation, the Ministry of Mining and the Ministries of Industry No (1) and No (2). The Ministry of Information is led by Kyaw Hsan, who held the same post under the military regime that ruled Burma until last year. He is regarded as a hardliner opposed to reforms initiated by President Thein Sein. Former Minister of Industry No (1) Aung Thaung is currently acting as the government's chief negotiator in talks with ethnic armed groups, and former Minister of Agriculture and Irrigation Htay Oo now serves as the head of the ruling military-backed Union Solidarity and Development Party. Former Ministry of Industry No (2) Soe Thein, former Minister of Mining Ohn Myint and former Minister of Co-operatives Tin Htut also have active roles under the current administration. Khine Maung Yi, a Lower House MP from the opposition National Democratic Force, told The Irrawaddy that he welcomed the report, but urged the respective ministries to carry out thorough investigations and take action against those responsible for wrongdoing. Lets not get too excited with this...think for a moment what is this all about...so simple??? They should inspect Transport Minister too. The present minister is one of the most corrupted guys in the gov:t. He put his men at every post in the ministry. He took money thru (from) DGs,Mds,contractors,aircrft agents, spare parts suppliers, airlines, ticketing agents, etc...He put his daughter and son at the middle to make every contract dealing. He had put a lot of money into his pocket while he was acting as a MD of Shwe Inn Wa company (labor export company formed under War Veteran Organization) from those who were mad to go to Korea. He is escaped because he is the same batch friend of Thura Shwe Mann and U Soe Thein. the misnister incharged and related responsibilities and government should take action against them. Since these are tax payer money and stole from poor people and should return all to government as soonest including momey kept at OCBC, DBS & UOB (Singapore)by MEC & Oo-Paing. These will be part of USD 11 biillion. Ali Ba Ba & 40 thieves,the old story from Arabia.But in our country Myanmar, we have Senior General Ali Ba Ba and Generals, Junior Generals and relatives and friends and Associated people such as Ex; Military personals, taking post as Ministers, Dy Ministers, MD, Directors, and Chief of every departments are the same group of STEALING society as very big group of THIEVES, that is their duty. That is their Goal to Hold power, that is their Main Goal. The government appears to be telling The Lady that they can clean up their own messes. Let's see what happens. WE ALL KNOW THIS REGIME FOR THE LAST FIVE DECADES AND HAVE NEVER ONCE WITNESSED GOOD FAITH OR INTENTION IN THEIR WORDS AND DEEDS. THIS IS JUST A NEW PLOY OR GIMMICK IN THE GUISE OF DEMOCRACY. IT IS NOTHING BUT AN ELECTION GAME TO SHOW THE BURMESE PEOPLE THAT AUNG SAN SUU KYI IS NOT THE ONLY TALKING ABOUT THE OPENNESS AND JUSTICE. THIS GOVERMENT, WHICH CAME THROUGH NARGIS CONSTITUTION AND ELECTION IS EQUALLY CAPABLE OF DOING SAME. Tall buildings or having nuclear arms will not make our country as a proud and powerful nation. Better health & education, reasonable human rights record and less corruption (good ranking in TI corruption index) will do it. I wouldn’t be reluctant to use as much as $ 500 million to engage consultancy to fight corruption. We need “expert” to tackle this long standing problem. Democracy itself will not automatically fight corruption, but will boost it in some cases. Corruption is very complex issue and not limited to dictatorships, autocratic regimes or command economy. It can be anywhere if we do not take care. There must be a comprehensive “corruption act” and proper enforcement. Long standing corruption in Burma should not be underestimated and ignored while marching towards democracy and national unity. 4. Taking action to those found guilty of corruption in the past might be just wasting of time and energy with no ends. Nobody in Burma can claim they are not involved with corruption either as a victim or a culprit. 5. Start to practise “ zero tolerance on corruption” now and apply strict enforcement. Will the government have the courage or guts to take action on these people? I don't think so.They are backed by the government of the USDP. But lets watch and see. To have greater transperancy, accountability towards public, government auditors general must have authority and power to raise questions and detailed checking thereupon that whether public funds are being used for economy, efficiency and effectiveness of all union citizens. The current government menbers involved should be dismissed and charged. The corrupted guys are several times more than this. However, we have seen some rare pointing against the top guys in 50 years of random junta's corruption history. What a bout the main actor Than Shwe ?? We would like the reaction of said six former Ministers . Are they willingly going to resign for the present posts ?? Is the U Thien Sein preparing to take any action against the regimes ?? How a big shame is it before the world ?? It is not too late to take action of those who abused their power for their own gain. Those corrupt officials are the thorn of the new Myanmar. It is time to clean house for a better future of Myanmar. No one should be above the law regardless of their post or position. Every country must have their own independent audit without fear to anybody. Thein Sein's government must encourage the Audit department to do more. This current government should remove those rogue ex-generals and their followers out of those ministries. If Thein Sein's government wants real democracy, he must clean up those corrupt high and low level of employees in his new government. What do you intend to do with these 6 key ministries? Remove these Ministers from office? Compound and confiscate all their assets? Burma's international reputation and Asean Chairmanship are at stake. Asean cannot allow itself to be led by bad example. We know who Kyaw Hsan is. We also know who Soe Thein is. And we all also know who Tin Htut is. They are thieves and robbers. If Thein Sein fails to tackle this serious problem, no one will trust his leadership. Fake election, fake democracy and ministers with "Fox under sheep's skin" need to go to jail, not to lead ministries. Sr Gen Than Shwe's Cabinet could be dubbed - Ali Baba & Forty Thieves. 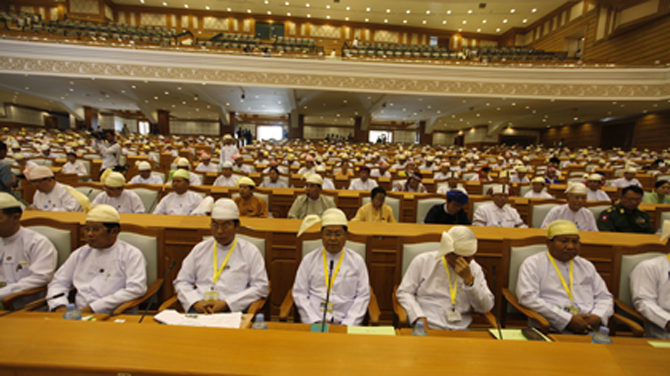 All these guys (including Than Shwe) should be put on trial for corruption, Hm !